Iran’s supreme leader Ayatollah Ali Khamenei said on Sunday the armed forces should increase their combat capability regardless of political considerations, in an apparent allusion to continuing nuclear talks with the West aimed at easing tension in the Middle East. “Given our vast maritime borders and the enemy’s huge investments in this area, our armed forces should continuously improve their (combat) readiness, irrespective of political calculations,” Khamenei told a gathering of senior navy officials during a ceremony to mark the “Navy Week” in Iran. 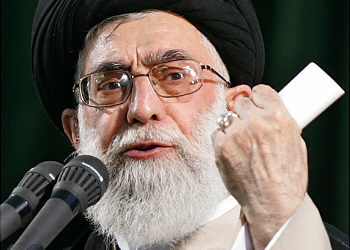 Khamenei, who commands all branches of the armed forces in addition to other key centers of power in the Islamic republic, did not mention any countries by name but he normally uses “enemy” to refer mainly to the United States and Britain — both of which have intervened in Iran over the past century. “Peacetime offers great opportunities for our armed forces to … build up on preemptive capacities,” said Khamenei, with state television playing excerpts of his speech. The United States and its key regional ally Israel have both hinted they might bomb Iran to prevent it developing nuclear weapons. Iran denies any such ambition and insists its atomic program is designed for civilian projects. With Khamenei’s blessing, Iran’s moderate President Hassan Rouhani launched a diplomatic initiative to resolve a 12-year nuclear dispute, hoping to save his country from punishing global sanctions. Tehran and six world powers missed a self-imposed deadline on Nov. 24 for a deal, but gave themselves seven more months to overcome their many differences. Despite his reserved support for the negotiations, Khamenei, perceived by many as a hardliner, remains distrustful of Western intentions in the region and insists that Iran’s defense capability, including its controversial missile program, must not be part of any broad diplomatic deal. In tandem with Rouhani’s diplomatic overture, generals appointed by Khamenei are maintaining a relentless war rhetoric and unveil on an almost daily basis what they say are new innovations in weaponry. However, Admiral Ali Shamakhani, an ally of President Rouhani who serves as a top security official, sought to temper the bellicose language on Sunday. “Our missile capability, like our nuclear, is inherently peaceful and geared for self defense,” the official IRNA news agency quoted his as saying. If your missile capability is peaceful like your nuclear capability, you don’t deserve to have nuclear power plants to create “peaceful” weapons.